Rajasthan Election 2018 Highlights: Incumbent Chief Minister Vasundhara Raje has exuded confidence that she would be elected as the state's chief minister once again. Rajasthan Election 2018 Highlights: Over 72 per cent turnout was recorded in the assembly elections of Rajasthan. Immediately after polling ended, various exit polls surveys predicted victory for the Congress. The exit poll results were in line with the pre-poll surveys that had projected a win for the grand old party. The state today voted for 199 seats. Both BJP and Congress relied on their political heavyweights during a high-octane election campaign. The voters today exercised their franchise in 51,687 polling booths. The state witnessed a direct face-off between BJP and Congress in as many as 130 seats. Earlier in the day, incumbent Chief Minister Vasundhara Raje exuded confidence that she would be elected once again. In the last elections, the BJP had won 163 seats and the Congress 25. The magnitude of the Rajasthan polls can be gauged from the fact that Prime Minister Narendra Modi addressed 12 rallies and Congress president Rahul Gandhi has attended nine in the state. Polling in Rajasthan has concluded with 72.7 per cent turnout till 5 pm. This year, the Election Commission had set up all-woman booths for the assembly polls in Rajasthan. According to reports, the move received a mixed response with the voters and polling staffs were divided on it. Both men and women were allowed to cast their votes at these booths. 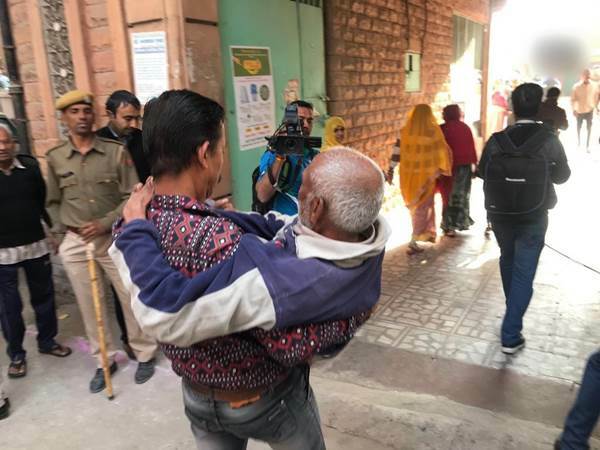 Rajasthan Elections: Over 72 per cent voter turnout recorded till 5 pm. In the last assembly elections, the overall turnout was 75.67 per cent. Nearly 60 per cent turnout was recorded till 3 pm in Rajasthan. However, the numbers of two hours are yet to be received. In the last assembly elections, the turnout was 75.67 per cent. ABP News- C voter: 58 for BJP and 135 for Congress. India TV - CNX: 75 for BJP and 115 for Congress. Times Now - Chrome: 89 for BJP and 102 for Congress. According to opinion polls, the BJP appears to be losing Rajasthan to the Congress. The saffron party has been in power in the state for the last five years. However, the mood of the people is against Vasundhara Raje. Speaking to PTI, NEET aspirant Utkarsh Agnihotri said: "Quality education and employment are the main issue for youngsters. There is a need to improve education infrastructure in the state, because many of us have to go out of the state for higher studies." Congress President Rahul Gandhi on Friday urged party workers to be vigilant after polls close today. He tweeted pictures of a private bus carrying EVMs and election officials who checked in a hotel with voting machines — these pictures had created controversy in Madhya Pradesh. In Rajasthan, people from border districts of Barmer and Jaisalmer today walked several miles through the desert to cast their votes. PTI reports that in these districts, polling booths were located at far off places due to which they had to take a long walk. Barmer and Jaisalmer share border with Pakistan and is part of the Thar desert region. Rajasthan Elections: 59 per cent polling was recorded till 3 pm in Rajasthan. In the last elections, 75.67 per cent voting was recorded in the state. The BJP had won the state by winning 163 of 200 seats. However, this time it appears to be losing the ground to the Congress which is projected to win over 120 seats. Rajasthan: Vehicles were set ablaze and vandalised in a clash which broke out btween two groups at polling booth at Subhash school in Sikar's Fatehpur. Due this, polling was affected for 30 minutes. Later, police removed the miscreants from the spot and voting resumed. Pre-poll surveys have projected a sweep for the Congress in Rajasthan. The grand old party is projected to win 102 to 135 of 199 seats. The BJP is predicted to be restricted under 90 seats. In 2013, the BJP had won 163 seats while Congress had to settle with just 21 seats. Rajasthan assembly election 2018: This is a maiden assembly election for Sachin Pilot. He is a two-time MP who is seen as a chief ministerial face if the Congress wins in the state. Sachin has represented Dausa and Ajmer Lok Sabha constituencies in the past. The contest in Rajasthan appears to be between the BJP and the Congress. Rajasthan Chief Minister Vasundhara Raje on Friday demanded action against former JD(U) leader Sharad Yadav for body shaming her during an election rally, saying she felt insulted by his comments and the Election Commission must take cognisance. Yadav made personal comments on Raje's appearance, calling her fat and asking people to give her rest, while addressing a rally in Alwar on the last day of campaigning in Rajasthan on Wednesday. “I feel insulted. 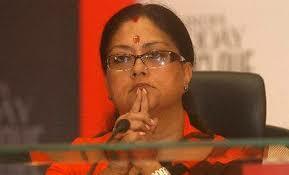 This is the insult of women," Raje told reporters in Jhalawar. adding that she was "absolutely shocked" and did not expect such a comment from an experienced leader. A video of former JD(U) leader Sharad Yadav was circulated on social media, with many labelling his comments crass and misogynistic. Calling CM Raje a daughter of Madhya Pradesh, he said people need to give her some rest as she was very tired. She was thin earlier, and was now fat, he is heard as saying. Raje's sharp response to Yadav's remarks came on a day the state is voting for a new assembly. The votes will be counted on December 11. The Congress on Thursday filed a complaint with the Election Commission against BJP candidate from Tonk Yunus Khan for allegedly violating model code of conduct by holding a press conference. PCC general secretary Sushil Sharma said the party has written a complaint to the Chief Election Commissioner of India and the state's Chief Electoral Officer against Khan who held a press conference on Thursday in violation of the code of conduct as the poll campaign ended at 5 pm on Wednesday. 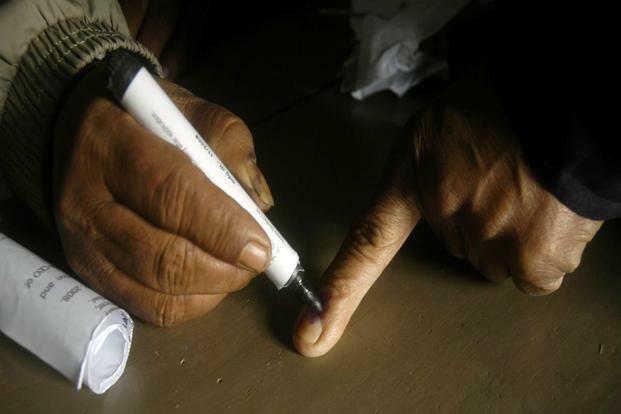 The polling in Rajasthan began at 8 am and the voting turn out was 20.9 per cent at 11 am, poll officials said. There were reports of some EVMs not working which delayed voting at a few polling booths. A senior police officer said polling was taking place peacefully and elaborate security arrangements are in place. As many as 51,687 polling booths have been set up in 199 out of the total 200 assembly constituencies where polling is going on amid tight security. 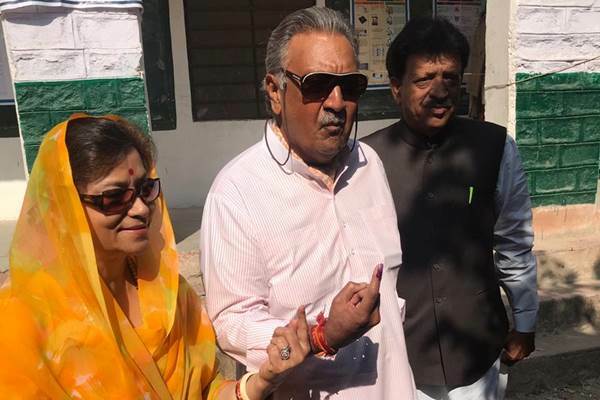 Erstwhile royals of Jodhpur, Gaj Singh and his wife cast their votes at polling booth no. 194 in Sardarpura constituency. Chief Minister Vasundhara Raje, Pradesh Congress Committee chief Sachin Pilot and other leaders were among those who exercised their franchise. Vasundhara Raje (Jhalrapatan), Sachin Pilot (Tonk), former chief minister Ashok Gehlot (Sardarpura) are among the 2,274 candidates in the fray. ABP News-C Voter, Graphnile, India TV-CNX, Times Now and News Nation have predicted a comfortable win for Congress. However, these opinion polls were conducted in November. Things do change quickly in Rajasthan and BJP is hoping that rallies held by PM Modi will convince voters to vote for it. Shajha, a 105-year-old woman casts her vote at a polling booth in Kishanpura, Jaipur. Family says,"There is no facility of wheel chair in this polling booth. We had to carry her inside the polling station so that she could vote." A group in Alwar has reached out to candidates contesting polls in Rajasthan, asking them to sign an agreement which states that if elected, they would focus on resolving various civic issues including those of cleanliness and stray animals within a year or resign. The signature campaign, carried out by 'Helping Hands, Alwar' group in the run-up to the voting on Friday, has found support with the first-time voters of the city. Rajasthan Election 2018 Live: Will Sachin Pilot sport safa on December 11? Congress leader Sachin Pilot is hoping that he will be able to put on a 'safa' (traditional turban) after four years. The Rajasthan Congress chief had pledged in 2014 to not wear the traditional headgear till the party returns to power in the state. Pilot exuded confidence that the Congress will form the government in Rajasthan and he will wear the 'safa' once again after the results for assembly polls, scheduled to be held on Friday, are announced on December 11. "After the party suffered a major defeat in 2014, I pledged to not wear a 'safa' till it returns to power. I decided to give up wearing the 'safa', which I love wearing as a symbol of culture," he was quoted as saying by PTI. Pilot said people gifted him 'safas' on several occasions while he was campaigning for the assembly polls. Instead of wearing them, he said, he would put them down after touching them to his forehead. "I am quite hopeful that people's blessings will make sure that the Congress wins the elections and I will be able to wear the 'safa' once again," he said. Rajasthan Chief Minister Vasundhara Raje, who is the BJP's chief ministerial candidate, is fighting against veteran BJP leader Jaswant Singh's son Manvendra Singh in Jhalrapatan, the constituency she has represented since 2003. Manvendra Singh switched to the Congress just before the election, making the fight tougher for Raje this time. She had won 63 per cent of the votes cast in 2013, winning the seat by a margin of 60,896. According to reports, total voter turnout recorded till 9 am is 6.1 per cent. Polling began at 8 am across 199 Assembly seats. 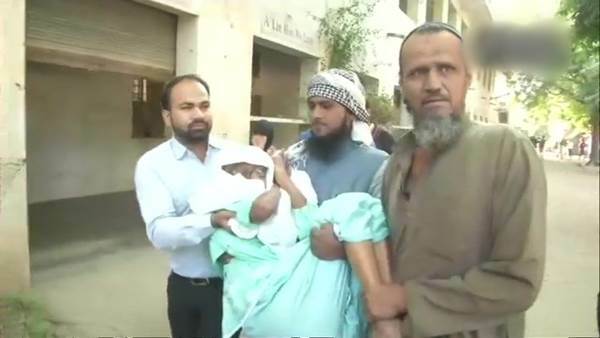 A 90-year-old man arrives at polling booth no. 104 in Sardarpura constituency of Jodhpur district to caste his vote. In his audio message to the workers of Rajasthan, Rahul Gandhi told them that they have to defeat the BJP by taking people to the polling booths and make the Congress win. "Put all your effort into your booths to defeat the BJP. The people are standing with you...The government that will be formed will be of poor people and of the weaker sections. It will be a government of farmers, small traders, Dalits, adivasis, backwards, and also your government," he said in the message posted on the Congress' official Twitter handle. The CPI (M) has warned the Congress that it will fail to defeat the BJP in the upcoming general elections if it continues to peddle "soft Hindutva". In an editorial in the latest edition of its mouthpiece, People's Democracy, the CPI (M) has referred to Congress president Rahul Gandhi's "flurry" of temple visits in the poll-bound states of Chhattisgarh, Madhya Pradesh and Rajasthan and said that it was a "pale echo of the Hindutva platforms." Voting is yet to begin in polling booth no. 253 and 254 in Ahor in Jalore district in Rajasthan following EVM malfunction. There are 4.36 lakh differently abled voters in the state, out of total 4.74 electors, and arrangements for their convenience have been made at the polling booths in the state, he said. 'Facilities like ramp, wheel chairs will be available while over 1.03 lakh volunteers of NCC, NSS, scouts and guides have been engaged. Arrangements for pick and drop have also been made for differently abled voters,” he said. Former chief minister Ashok Gehlot, who is also seen as a chief ministerial candidate for the Congress, is contesting from Sardarpura, a constituency he now represents. Gehlot has been the Rajasthan chief minister twice. Discus gold medallist in the 2010 Commonwealth Games Krishna Poonia is the Congress candidate in Sadulpur. Jat leader Hanuman Beniwal is a concern for both the parties. He founded the Rashtriya Loktantrik Party and has fielded 58 candidates. The main BJP rebels include four ministers — Surendra Goyal (Jaitaran), Hem Singh Bhadana (Thanagaji), Dhan Singh Rawat (Banswara), Rajkumar Rinwa (Ratangarh). BJP MLAs Navnit Lal Ninama (Dungarpur), Kishnaram Nai (Shri Dungargarh) and Anita Katara (Sagwara) have also defied the party. Rajasthan Assembly election Live: Will Sachin Pilot win in Tonk? Tonk is considered as the high-profile seat in Rajasthan. The constituency with a sizeable Muslim population is witnessing a keenly-watched contest between Sachin Pilot and BJP candidate and Rajasthan Transport Minister Yoonus Khan, who is the saffron party's only Muslim face in the elections. The BJP had initially fielded sitting MLA Ajit Singh Mehta in Tonk. But in a change of strategy, the party dropped him and sent Khan to take on Pilot. This is a maiden assembly election for Pilot, a two-time MP who is seen as a chief ministerial possibility if the Congress wins. He has represented Dausa and Ajmer Lok Sabha constituencies in the past. The election campaign saw a hard-fought verbal between the Congress and the BJP. pm Narendra Modi addressed 12 major rallies and Congress president Rahul Gandhi nine in the state. Both sides fielded their top leaders in the campaign. Union Minister Rajyavardhan Singh Rathore casts his votes at polling booth 252 in Vaishali Nagar, Jaipur. Rathore said, "Every single vote counts. We have to cast our vote today by thinking who is actually taking the nation forward." Congress' Chief Ministerial probable Sachin Pilot has cast his vote. Talking to reporters, Pilot said, 'People have tolerated enough in the last 4 years, now it’s time for a change.' Clearing the air on who will be Congress' Chief Ministerial face, Sachin Pilot said, "We will sit and discuss this after our party gets a majority in the election." Rajasthan Election 2018 Highlights: Among the five assembly elections, Telangana and Rajasthan are the last states to go to the poll. Polling has already been held in Madhya Pradesh, Chhattisgarh and Mizoram. The counting for all states is on December 11. The BJP has fielded candidates for all 199 seats and the Congress for 194. For the five remaining seats, the Congress is in alliance with other parties. The BSP fielded 190 candidates, the CPI (M) 28 and CPI 16. Of the total 4,74, 37,761 registered voters, 2.27 crore are women and 20,20,156 are registered as first-time voters, according to reports.